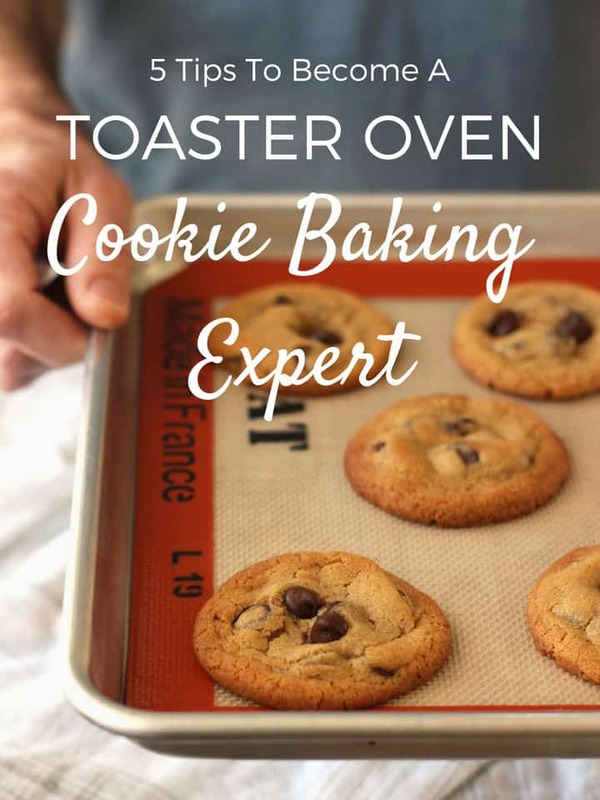 Become a Toaster Oven Cookie Baking Expert. 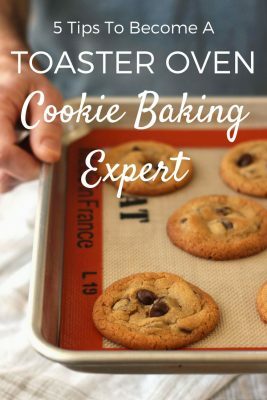 With these five tips, you’ll learn more about your toaster oven and how to bake any cookie recipe using it. 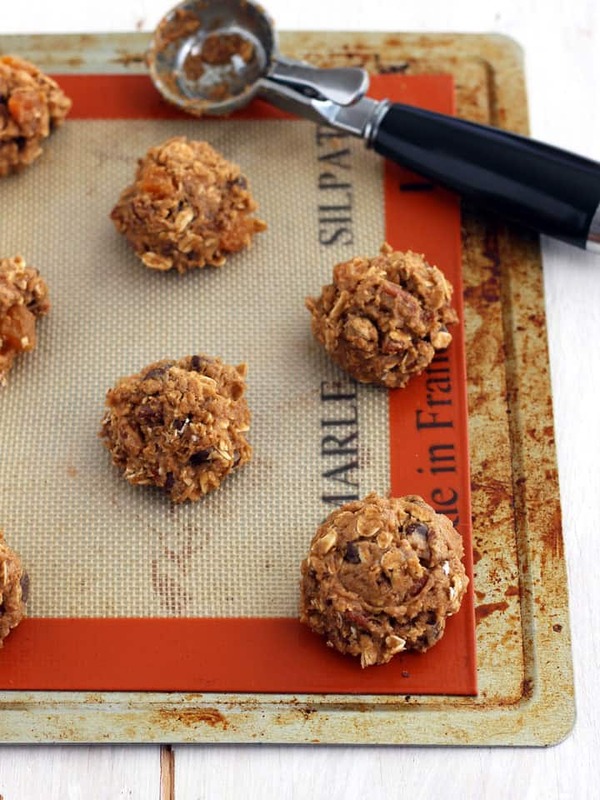 Your grandmother’s oatmeal raisin cookies are legendary. You’ve baked the recipe hundreds of times. The good news is Yes You Can! Even better, there’s no magic secret to baking a fantastic batch of toaster oven cookies. After years of baking crowd-pleasing cookies in our toaster oven, we’ve learned a few things. Below you’ll find our best tips for baking small batch cookies you can be proud of! Does your toaster oven’s temperature run hot, cold or just right? 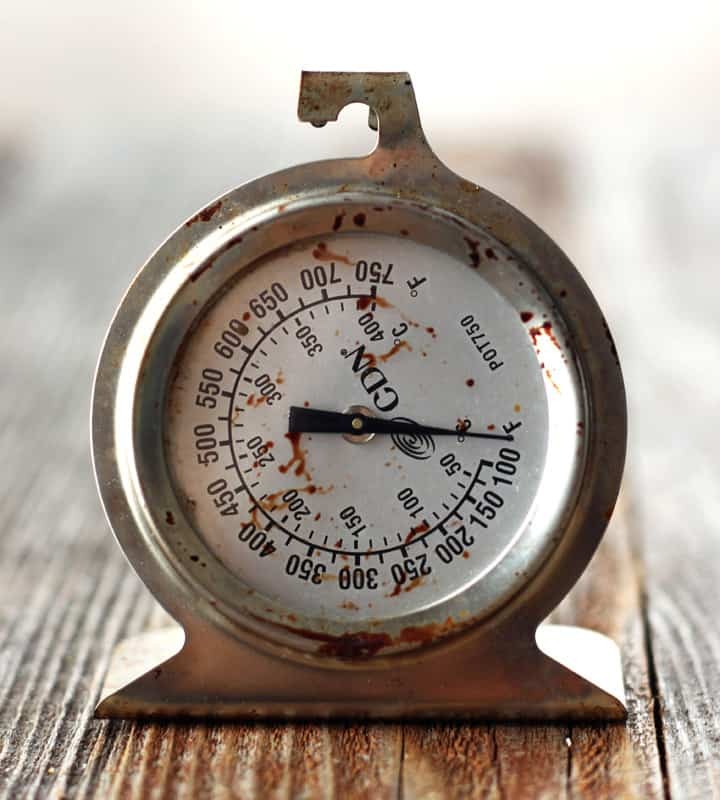 After a few simple tests with a basic oven thermometer and our toaster oven temperature guide, you will know for sure. Then it’s easy to make adjustments to any recipe’s baking temperature and time to accommodate your little oven’s heating quirks. Have you been using parchment paper in your toaster oven? Take a second and grab the box from your pantry. Look at it closely. Closer…. Yeah, it was an unpleasant surprise for us too. Since we found out, I’ve been reading every parchment paper box I see. 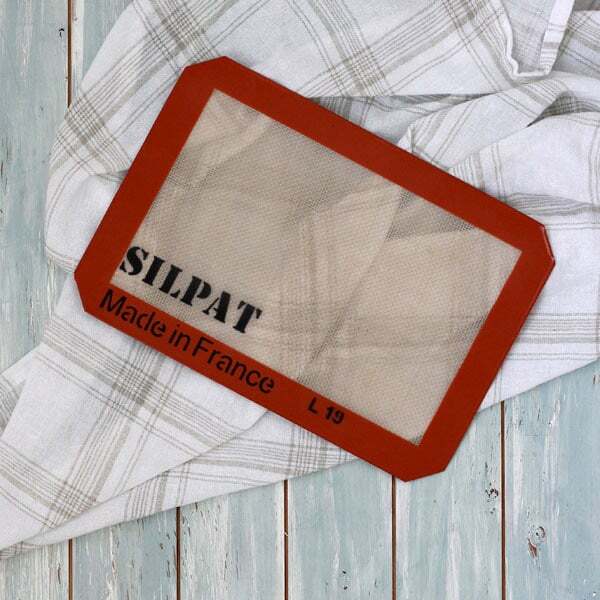 You can always grease your pan old-school style if the recipe calls for it but we like to use a Silpat® or baking mat instead. 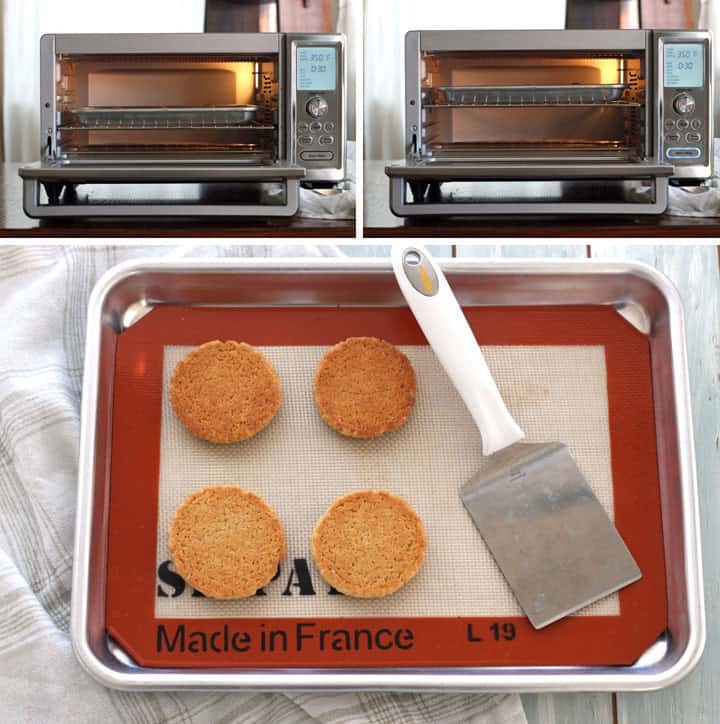 Check out this toaster oven silicone baking mats guide to learn more about them, how to use one in your little oven and where you can purchase them. Warning: Tempting as it is, do not cut a large Silpat or baking mat to fit your toaster oven. They have a mesh fiberglass inside that you don’t want to get into your food! You’ve verified your toaster oven’s temperature accuracy, have your cookie sheet prepared and are ready to get baking. But wait! If this is your first time baking that recipe in your toaster oven, take a few minutes and bake a test cookie. A test cookie (or two) will tell you everything you need to know about how best to bake a whole batch of cookies. Trust us, it’s better to sacrifice just one cookie than burn an entire batch. Now that you’ve got the timing down you can bake a whole batch! In our experience, the increased portions won’t dramatically affect the baking time. Occasionally, you may need to bake a full batch for an additional minute or 30 seconds. If your test cookie is burned or overcooked on the edges or bottom reduce the temperature by 15 to 25 degrees and bake another test cookie. The cookie on the left was baked at 375 for 7 minutes and came out overdone. For the cookie on the right, we reduced the temperature to 350 for 7 minutes and it was way better though we probably could have taken it out 30 seconds earlier. If your test cookie is taking twice as long to bake, increase the temperature by 25 degrees and test another one. In one of our toaster ovens, we have four rack placements and the “middle rack” is closer to the bottom heating element. This is where the majority of the heat comes from when using the Bake setting. Baking a batch of sugar cookies recently I noticed the bottoms were browning too fast while the rest of the cookie was baked perfectly. Instead of reducing the temperature for the next batch, I moved the baking sheet up one rack placement. This easily gave my cookies nice golden bottoms without making any changes to the baking time or temperature. Follow the same Test Cookie steps, but reduce the temperature by 25 degrees and start checking for doneness even earlier. Almost all cookie doughs spread but especially chewy chocolate chip cookies (recipe coming soon!). Before baking check your recipe for notes on if the cookies will spread and spacing recommendations. If your recipe doesn’t specify, leave at least 1 to 2 inches of space between the cookies. To keep from overcrowding the pan, you may need to bake your toaster oven cookies in more than one batch. But What if You’ve Only Got One Cookie Sheet? If that’s the case, let the cookie sheet cool between batches. 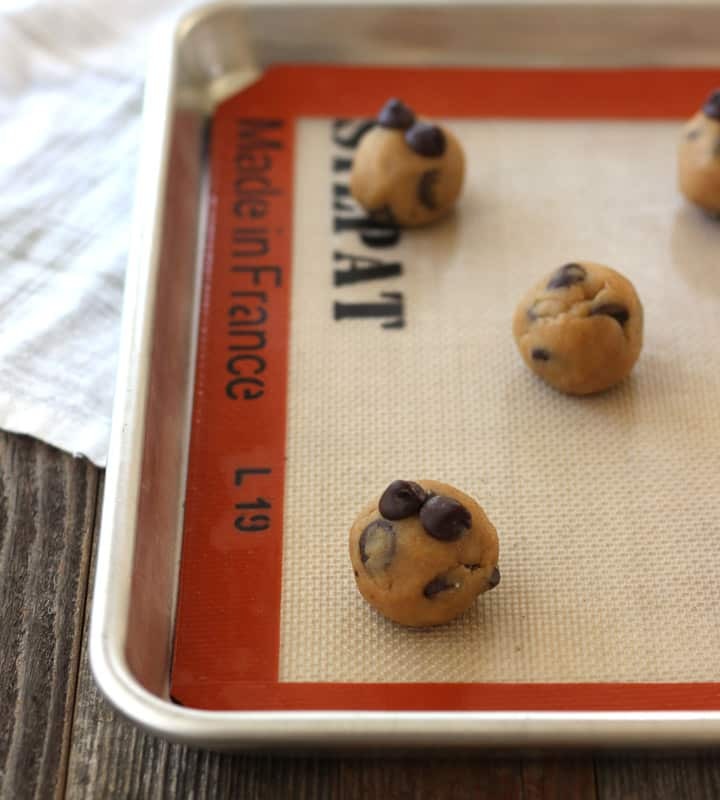 A warm cookie sheet will cause the dough to spread too fast and could burn your tasty cookies. To quickly cool a hot baking sheet run the backside under lukewarm water, dry well and bake another batch! Do You Want to Bake A Lot of Cookies? You might want to consider getting a second baking pan then. If you like the one that came with your toaster oven visit the manufacturer’s website they usually sell replacement pans. Amazon also has a bunch of differently sized smaller baking pans too. Before purchasing a pan you should measure the interior of your toaster oven to make sure it will fit. NOTE: The links below are affiliate links, which means that if you make a purchase through them, we will earn a commission. All ovens big and small have hot spots: areas that are warmer than others. While you can’t do much to change them, you can rotate your pan halfway through the baking time to equally expose your cookies and even-out any browning issues. We’re working on a series to help you “small-batch” your favorite large-oven sized family recipes. But until it’s ready, we know you still want to enjoy your Grandma’s famous cookie recipe, right? Well, you probably only want 2 or 3 cookies. So what to do with all the leftovers? To Thaw: Leave frozen cookies on a plate for 10 minutes to bring to room temperature. Rewarm in a 350 toaster oven for 2-3 minutes if desired. If you don’t want to stand at your toaster baking dozens of cookies all at once you can always freeze the dough. 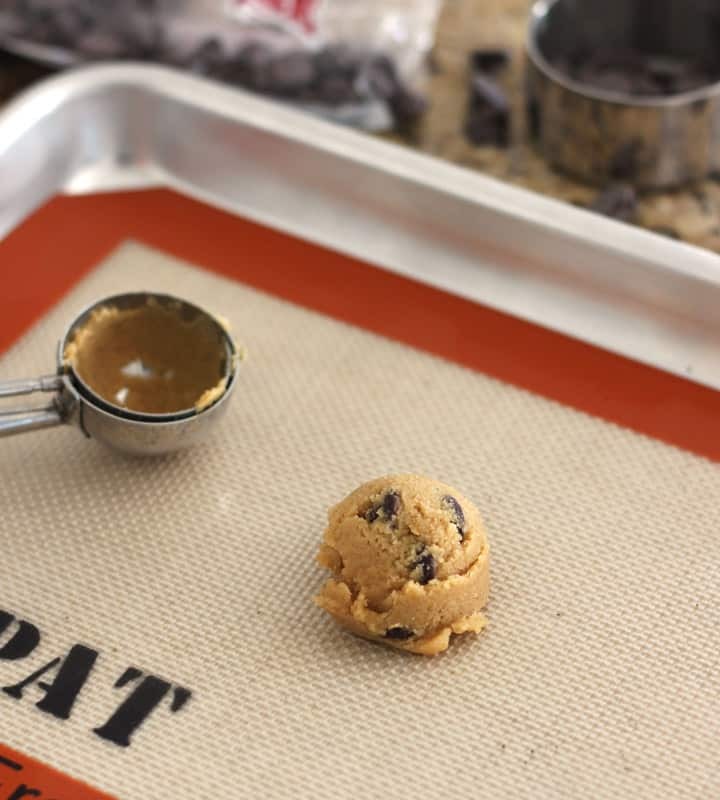 Roll or scoop the leftover cookie dough into evenly sized portions. 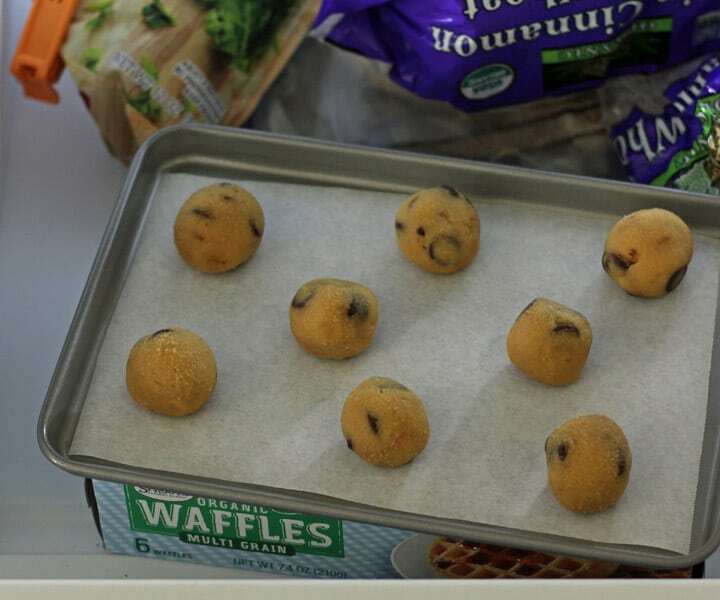 Then, place them on a parchment-lined cookie sheet in your freezer until frozen. Use a marker to write the original baking directions on a freezer safe bag. You can store the dough in your freezer for up to 6 weeks. Again, that’s for best flavor, the frozen dough will still be safe to bake and eat after 6 weeks. How Should I Bake The Frozen Cookie Dough? You can bake the dough straight from the freezer. Just add 2 or 3 additional minutes to the baking time. They won’t taste exactly like the fresh cookies, baking freezing cold cookie dough will result in a thicker denser cookie. Instead, we like to bring the frozen dough to room temperature first (about 10 minutes) and then bake as originally directed. 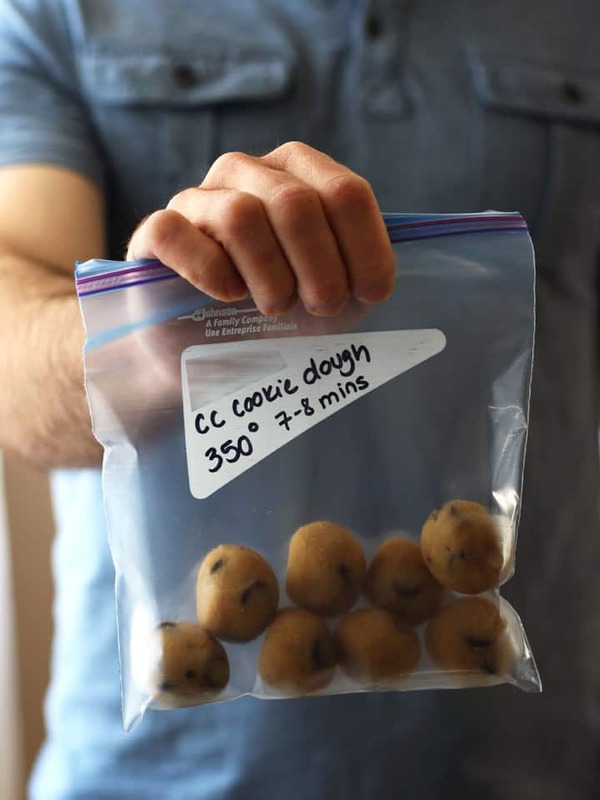 Keeping a batch of cookie dough in the freezer is our favorite baking tip. 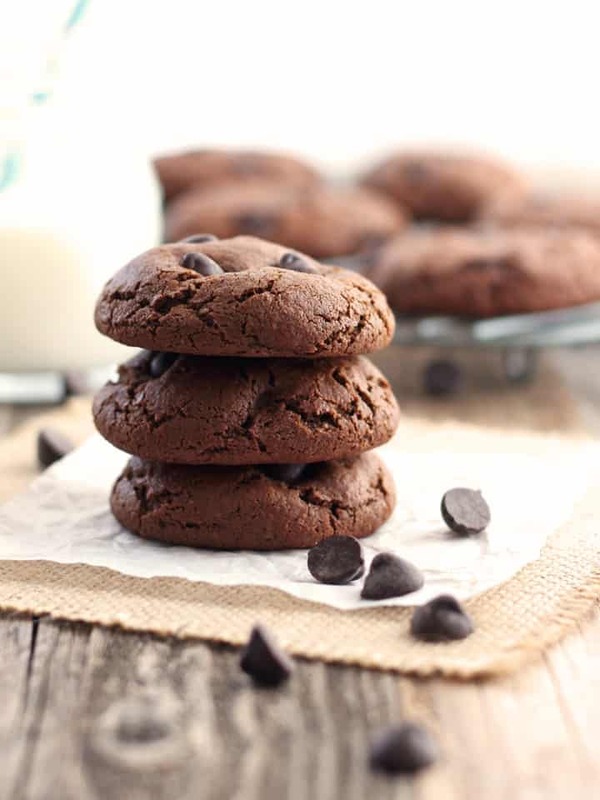 Without dirtying a single dish, you can enjoy a freshly baked cookie (or two) in 20 minutes or less. We do it all the time with our double chocolate chip cookies and it’ll work great for your Grandma’s famous oatmeal raisin cookies too! And if you share your biggest frustration when baking cookies with a toaster oven in the comments below, we promise to do our best to help! This may sound goofy, but am I suppose to take crumb tray out of toaster before baking cookies, for example? Hi Michaele, that’s not a goofy question at all. Unless your manual says otherwise, you should always leave the crumb tray in while cooking and/or baking. The crumb tray is great for catching spills and splatters and in some ovens (like our larger countertop oven) the shiny metal has a reflective property that helps to cook food more evenly. Any guidelines for quick breads? Or even regular breads? We’re working on a series of posts with toaster oven muffins tips and a troubleshooting guide that we’ll hopefully have ready next month. A lot of the info will apply to quick bread too. Using our toaster oven’s conventional heating I find mini loaves usually bake well at the temperature called for in the recipe but larger full-sized loaves do better if you reduce the temperature by 25 degrees. If you reduce the temperature it may require a little more baking time but will help to prevent over-browning on the top of the loaf. We just picked up the Convection Oven Cookbook by Beatrice Ojakangas and she recommends if you’re using convection to bake any kind of breads to reduce the temperature by 50 to 75 degrees but to not go below 300F. We usually reduce at least 25 degrees when using convection but sometimes do need to go 50 degrees lower depending on the recipe. Hope that helps, happy baking! Hi. any reason I couldn’t use foil to line the baking sheet? Most toaster oven manufacturer’s have specific instructions about the use of foil in their toaster ovens. Some even caution against it completely. 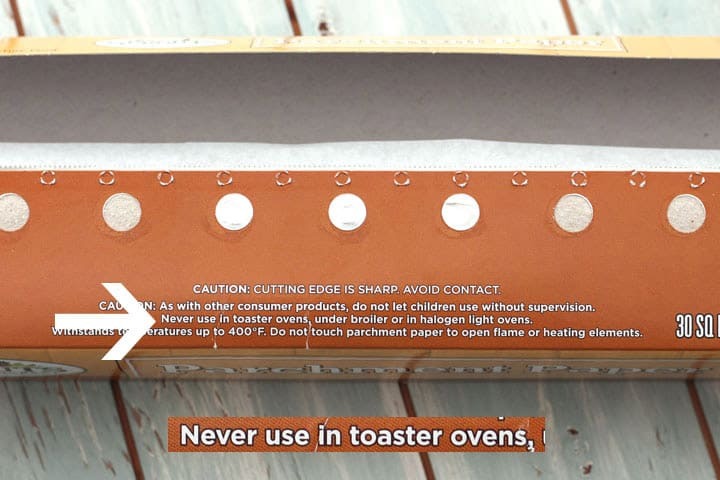 So you’ll want to check your manual or speak with the manufacturer before using foil in your toaster oven. 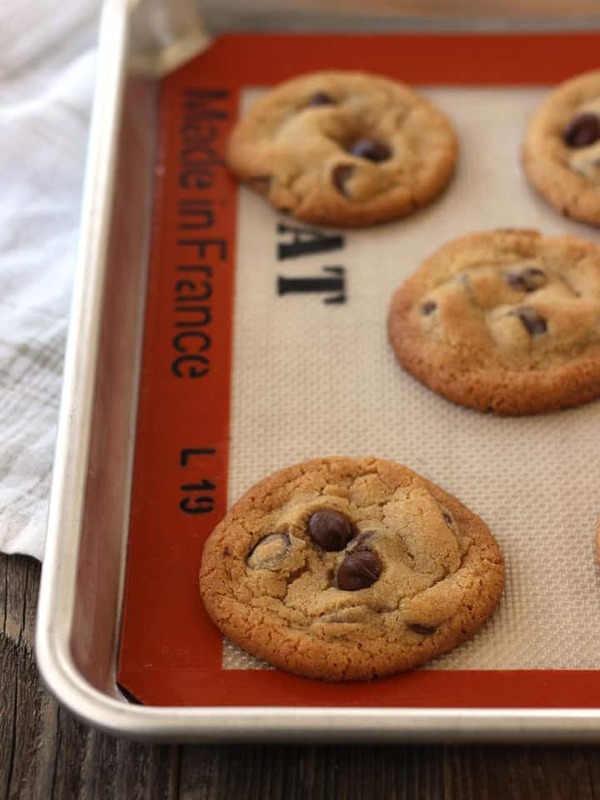 Personally, if I can’t use a baking mat I just go old-school and lightly grease the pan because any cookies I’ve ever baked in a traditional oven using foil always over-brown on the bottom. 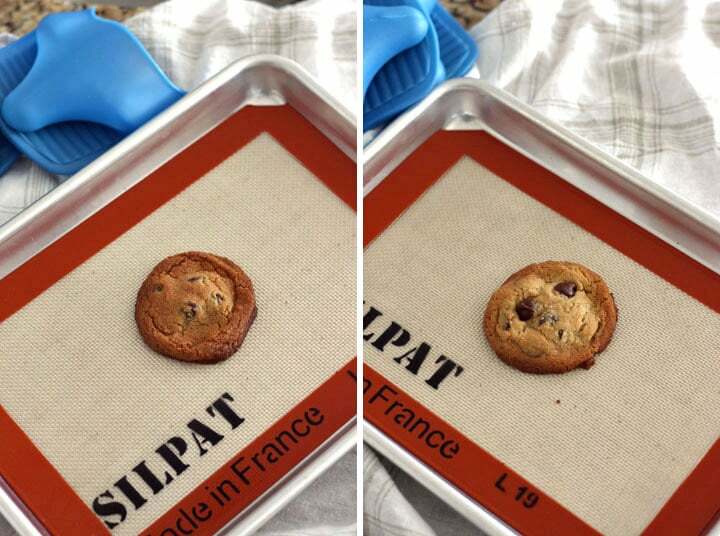 Can standard size silpat be cut to fit small cookie sheets? Hi Tim and Brie! Thanksabunch for your Toaster Oven Cookie baking tips. I have a Oster convection toaster oven which does a great job but I am probably going to eventually get a slightly bigger oven (eyeing the Breville!) since the interior dimensions (width) is about 11 3/4 which wont allow me to get a 13 x 9 pan in there and I can’t find a cookie sheet to fit so I can get the toaster oven silpat you recommend. Plus I’m pretty much eyeballing the temperature since it isn’t digital. Anywho love your blog and keep up the great information. This cooking/baking noob needs all the help she can get. Hi, Cindy! Thanks for dropping a note it’s great to hear from you! We used to have an Oster convection like you and loved using it. I think it might have been the same as yours. If that’s the case, you might want to try measuring the cookie sheet. The 4th picture from the post above is actually the silpat on the flat baking sheet that slid into the grooves in our Oster. Thanks! I measured the width at the grooves and it’s just about 12in. What brand is that baking sheet I can’t seem to find one online that is the right size. Sorry I got your hopes up Cindy because it appears the Oster doesn’t come with a thin metal cooking sheet, just the black baking pan. I was looking at our old manual for their customer service number to call and ask about the baking sheet when I noticed it wasn’t on the parts list. 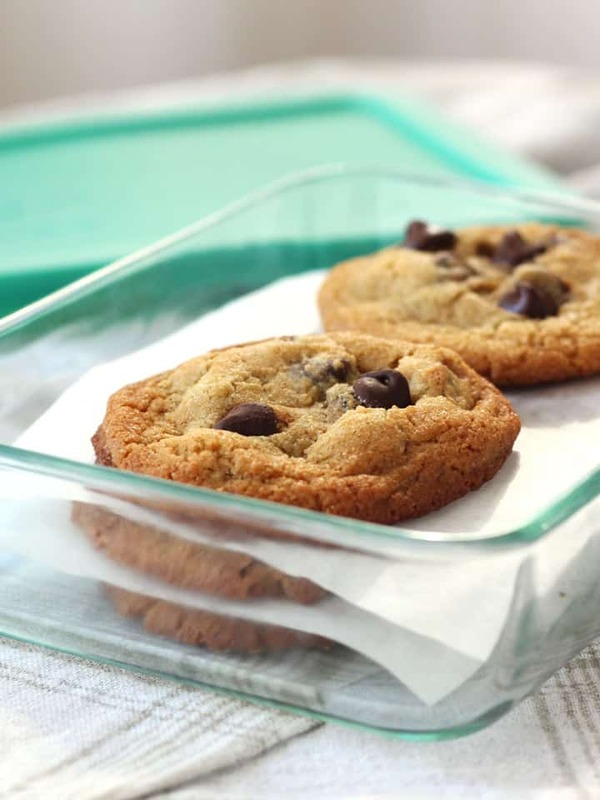 So, this is equally embarrassing and hilarious…we’ve been using the crumb tray as a cookie sheet this whole time! I’d love to say it was a clever hack we designed but nope, we just slid the tray in and when it fit we figured that was the baking pan and kept using it that way. Anyway, it’s obviously not the recommended use but your crumb tray could work in a pinch. If yours fits, you might want to call Oster (800) 334-0759 and see the price for a second crumb tray that you can use as a baking sheet? That is funny. I didn’t think my oven came with a crumb tray but it did. I found a replacement online and will be ordering one soon. I assume since you used it that way you didn’t have any issues with warping or anything. Will also get the silpat. Thanks alot for the advice. Saving me a bunch of money not getting the bigger oven, may ask for my birthday this year though! Yeah, when we slid the tray into the grooves on the sides of the toaster oven it was a tight fit that kept the sheet flat the whole time. The only issue we had was not being able to rotate the pan. When baking cookies, I would try to keep the dough away from the silpat edges so I could rotate the silpat halfway through the bake time but otherwise it worked great. Can’t wait to hear how your setup turns out Cindy! Do you have a similar guide for baking muffins in a toaster oven?